Let's tackle one of the most feared and often misunderstood aspects of airbrush makeup: the assembly, disassembly and cleaning of your airbrush. The bad news: cleaning is boring. There is no way around it. Even if you are a bit obsessive compulsive like me, and even if you love your instrument and enjoy taking care of it, like I do. It is also inevitable. You cannot skip or delay cleaning your airbrush at the end of a session, at least minimally, or you might compromise its functioning. But more on that later. The good news: cleaning an airbrush is NOT difficult and does not take much longer than cleaning a medium size brush once you get used to the process. If you consider that an airbrush does the job of many brushes, or if you are like me of all of them, you will realize that you will in fact save time by cleaning just one tool as opposed to many. A simple matter of practice. Practice is all it takes in order to become fast and efficient at cleaning your precious tool without causing damages. Once you become familiar with the pieces you will get faster and faster. These days it takes me less than a minute to disassemble any of my airbrushes. In the enclosed video I have slowed down the process a bit to show you how it works as clearly and as closely as possible. The video wasn't easy to film and may not be technically perfect, but it sure is clearer than any I have been able to find. The airbrush I am using in the video is the Temptu SP-40. 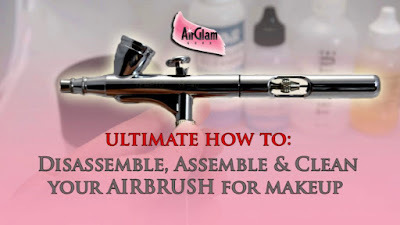 This excellent tool is produced by Sparmax and has the exact same parts and look of its more popular twin, the ubiquitous SP-35 which is the flagship airbrush of most makeup brands, including Temptu, Graftobian, Kryolan, Airbase, Mistair, Monda Studio, Ten Image and Sparmax's own Element Two, making it the most widely used airbrush for makeup. Other brands use their own proprietary airbrushes or more generic tools produced by third parties. These may have parts that differ slightly (such as a floating nozzle instead of a screw in one, or a primary lever that is attached to the piston below), but the process of assembly and cleaning should not change much. I almost always prefer not to voice over my videos as I would like them to be enjoyed by anyone all over the world regardless of the language they speak, so I'd like to add a few more suggestions here and point out a few things that may be overlooked when watching the video. Always work over a tray, a plate or any kind of flat enclosed surface when disassembling your airbrush. There are many tiny pieces, and these will easily fall from your hands. If they hit the floor you may spend hours looking for them, and they may get damaged by the fall. Except for the hose attachment and the air valve, no part of the airbrush should be wound too tightly or you will compromise the proper functioning of the parts. The spring case and needle chucking nut in particular need to be carefully balanced, or the lever and needle will not function properly. Don't worry, you will develop an awareness of the right balance very quickly after the first few times. 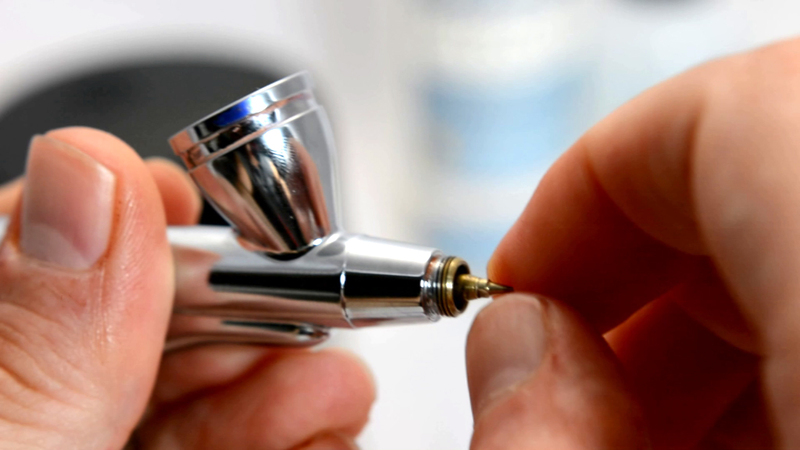 The nozzle is the most delicate part of the airbrush, and the one where almost all the issues with the flow originate. Once again, be extra careful when unscrewing and screwing in the part. If you apply too much pressure the wrong way, the tip of the nozzle will break and separate from its base, which will remain stuck in the airbrush threading. Pay extra attention to the way the airbrush is turned in the video, and to the direction in which I am turning the wrench when removing or reattaching the nozzle. If the nozzle does break DON'T PANIC, it will be relatively easy to clear the base from the threading using a tooth pick, and you will be able to buy a spare nozzle from your brand's website or directly from a Sparmax retailer. 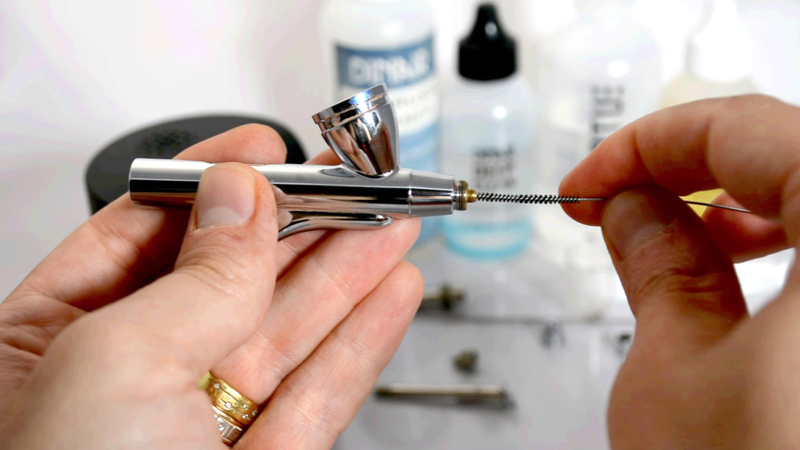 The needle is the other delicate part in your airbrush. The tip is very fine and if handled improperly it can bend ever so slightly and compromise the product flow. Once again pay attention to how I use my fingers in the video to lean on the airbrush body when inserting the needle. If you do bang the tip of your needle there are easy ways to repair it, or if it has bent too much once again you can always buy a replacement needle from your brand's website or from a Sparmax retailer. Aside from that little extra attention that you have to pay the nozzle and needle, the airbrush is not that delicate at all. It's made of steel, and breaking it is actually very difficult. Most times when people think they have "broken" their airbrush they simply tightened a screw too much or too little, or there is some extra cleaning that they neglected to do. The video shows you five different stages of cleaning. You can use them in sequence or one step at a time and in any order you see fit, but the answer to the question is: clean whatever is appropriate whenever it's needed. There is only one rule: you must always clean your airbrush at the end of a day's work, and if you are using alcohol based products, you should clean (or at least rinse) as soon as you're done. This is because alcohol based colors dry very quickly and will clog your system very fast. If it does happen don't worry, everything will go back to normal after a deep clean, but it will take a while. This is another reason why you should always have at least one spare airbrush if you go out on a job. And talking of jobs, a deep clean is not necessary at the end of a session if you are using the airbrush on yourself or for home studying, but you should always do one the day before you work on a client. You want your airbrush to be in tip top shape in a professional situation, and never risk embarrassment. I personally test the airbrushes before I leave for a makeup session, you can never be too sure. Almost every makeup brand has its own cleaning product. This is because each formulation is slightly different (water base, hybrid base, silicone base, alcohol base...). If you just ran out of your specific cleaner or you want to carry just one that will work with all the different formulae, Isopropyl Alcohol (IPA) at 99% purity is your best bet, as it will work on anything. A more "natural" alternative to alcohol 99% is Nurturing Force Airbrush and Brush Cleaner. This is a wonderful, non toxic product made of food grade ingredients that comes as a concentrate, so you will need to mix a few drops in the cup with some water. It will be slower than alcohol 99% on silicone and alcohol based products, but it will do its job well and with no chemicals involved. 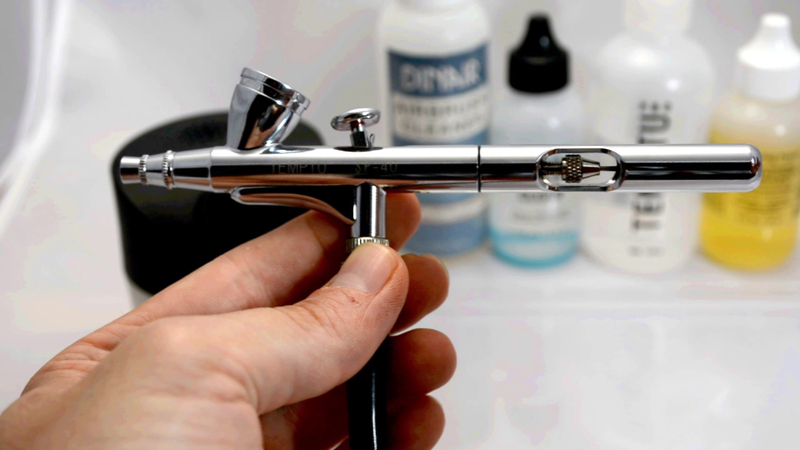 One of the best kept secrets in the airbrush makeup industry is this product by Dinair called Deep Clean. It does an amazing job of dissolving the toughest clogs in just a few minutes. It must be used sparingly because it's not exactly ideal on the inner plastic o-rings that are present in the inner recesses of your airbrush, but if you stick to the suggested times (just a few minutes) it's perfectly safe to use. I use it very often instead of IPA to clean the nozzle as shown in the video. they plug in the mains (there are some battery operated ones too, but they don't seem nearly powerful enough). You only need to use it for the pieces that come in contact with the colors, but of course you can put in all the other ones as well if you wish, just remember to disassemble everything first, or it will be ineffective. Airbase airbrush Pro makeup kit review!